Editor’s note: Robert Wiltbank, PhD, is a professor at Willamette University, where he and Wade Brooks run an angel investing fund managed by second-year MBA students. He is on the board of the Angel Resource Institute, and is a partner with Montlake Capital (a late stage growth capital fund) and with Revenue Capital Management (a royalty based lender). He’s c0-authored two books and many academic articles. 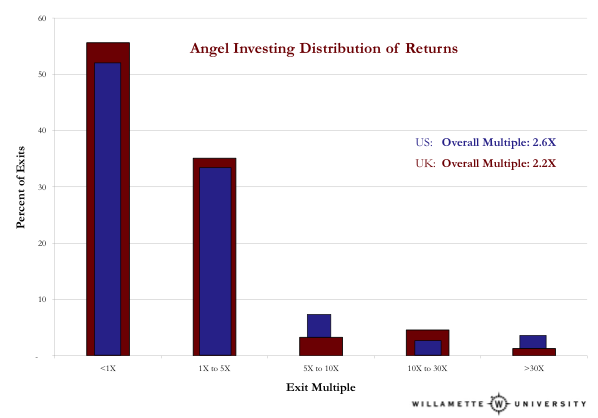 Through research backed by the Kauffman Foundation, NESTA (a UK-based entrepreneurship foundation), the University of Washington, and Willamette University, I’ve compiled the largest data set on angel investor financial returns that exists. The angel investors I was spending time with didn’t seem so naïve or incompetent. While not professional investors, most angels are very successful in their own right, overwhelmingly as a result of their own entrepreneurial endeavors. Their firsthand knowledge of creating new businesses and new markets seemed quite relevant to successfully investing in other entrepreneurs working to do the same. To keep things in perspective, it’s important to remember that most ventures, even great ones, don’t ever take venture capital investment. A little less than one-third of IPOs are of venture capital-backed firms. While this is really impressive given that VCs invest in less than 1 percent of new ventures, it still means that two out of every three IPOs are of companies that never had any venture capital investors. Angel investors, like savvy entrepreneurs, don’t necessarily view raising formal venture capital investment as a measure of success.